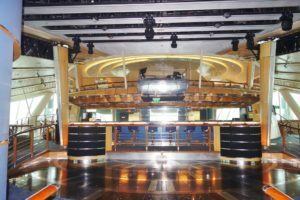 The Enchantment of the Seas is the largest of the Royal Caribbean’s Vision class, as it went through a major renovation in 2005, being cut in half and extend over 70 feet. 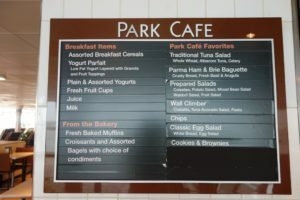 More recently, the ship was updated to get some additional upgrades, including the Park Cafe. 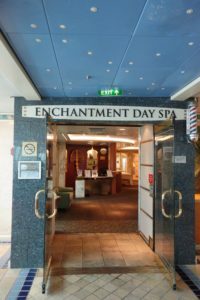 For a ship of its size, Enchantment of the Seas hosts plenty of amenities and public spaces, even if the cabin layout and furniture was in need of some sprucing up. 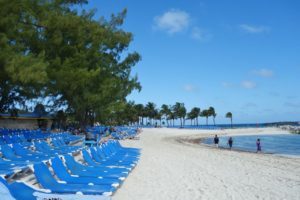 For a short Bahamas cruise, the ship offered plenty of activities making it tough to cram everything into only 3 days. 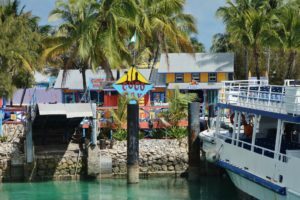 This short 3 day Bahamas cruise is really about getting away for an extended weekend of fun, sun, and relaxation. 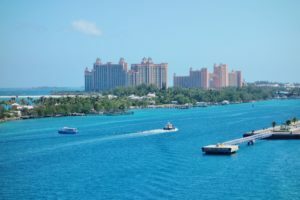 That said, you do stop in two Bahama ports-the historic Nassau, Bahamas and Royal Caribbean’s private island Coco Cay, Bahamas. Both stops have a diversity of things to do and see depending upon how much you want to cram into your vacation. 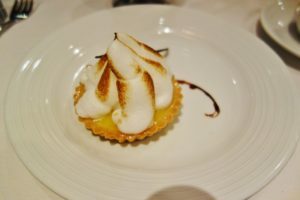 Given that this was the smallest ship we had sailed on in 8 years, and the shortest cruise we have ever been on, we weren’t sure what to expect. 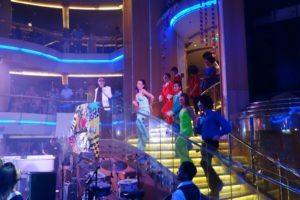 But, we were more than pleasantly surprised on the number of activities and events running during this cruise. Never a dull moment. 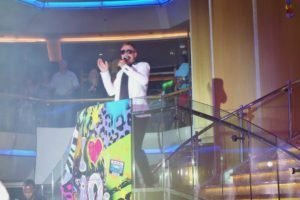 All of the great Royal Caribbean classic shows and parties were somehow squeezed into the weekend. 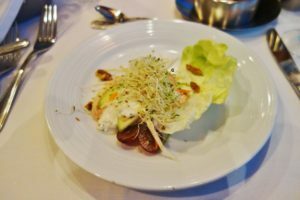 The food and entertainment was on par with Royal Caribbean standards. 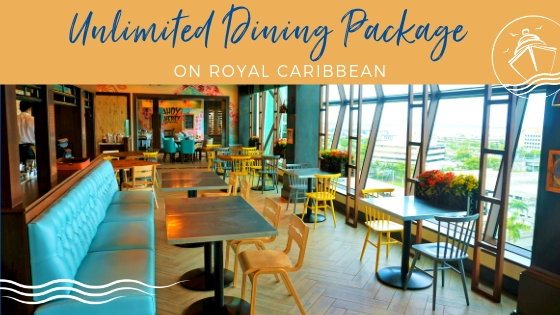 If you are looking to test the waters, this ship and itinerary is a perfect way to try out a cruise and get the complete Royal Caribbean experience. 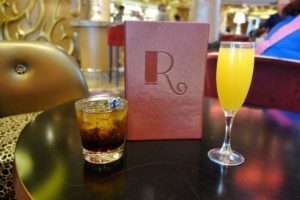 The new R Bar, our favorite Park Cafe, and the multiple Coke Freestyle Machines were nice additions, but some of the other venues of the ship were in need of some updating and refurbishment. Lounge chairs in some venues and towels were more than worn, and the oddly placed Boleros Bar and Spotlight Lounge seemed underutilized. 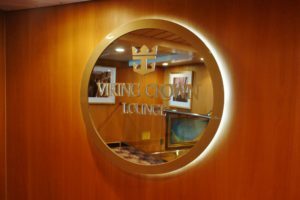 The main hub of nightlife was the Viking Crown Lounge, which seemed a bit small for the crowds of people looking to get their grove on. The Enchantment of the Seas over delivered when it came to a short cruise. 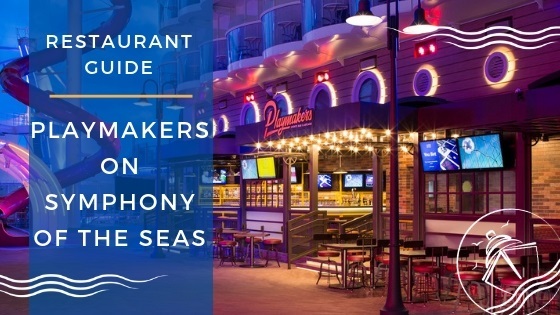 First rate entertainment, excellent food and service, and plenty of Royal Caribbean staples to be had. 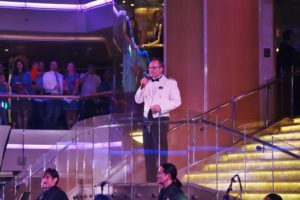 The cruise director Mark and his staff kept the party going. 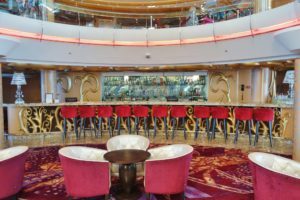 The bars onboard Enchantment of the Seas were the busiest I have ever seen on a cruise ship-seriously. Many travelers, like us, purchased drink packages and they came ready to use them. Fellow travelers were definitely more of an eclectic mix than other cruises. Plenty of first time cruisers, and others just out to have a good time, including at least 10 bachelorette parties. Getting seats for shows was relatively easy, and public spaces (beside bars) never felt too packed, even the casino was not too crazy. 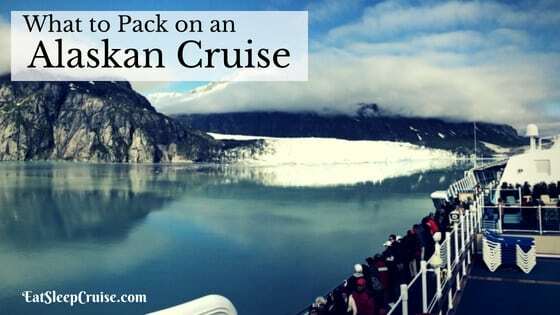 If we had the vacation time, we would certainly sample a four day cruise on this ship! After just returning from our sailing on Quantum of the Seas in January, how could it be that we are already on another cruise? Well, chalk it up to some spending habits and rewards points, as well as the persistence of the Princess. The math aligned well enough for us to schedule a short three day cruise, paying only mandatory taxes and fees. 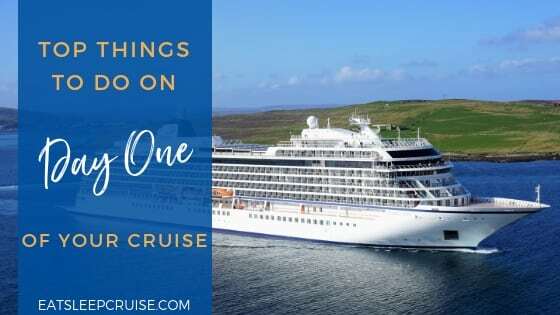 Yup, the cruise and flights were free, and we even got $100 of onboard credit, which meant our shore excursion was also paid in full. Not a bad deal. 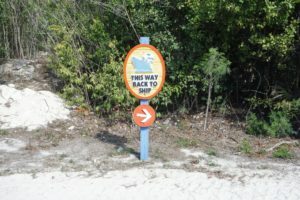 So, yes, I was easily convinced to book this short getaway on Enchantment of the Seas, wouldn’t you? It had been almost 5 years since we sailed from Port Canaveral, for our Freedom of the Seas cruise in 2010. On that particular occasion, we flew down the morning of the cruise, so didn’t book a hotel in the area. Given the New England weather, we now play it safe and fly down the night before. Looking online at hotels, I found a package deal that included transport from the airport to the hotel, from the hotel to the port, and then from the port back to the airport. Given the distance Orlando International Airport is from the cruise port, I thought this made financial sense. This three day cruise left on a Friday, so trying to limit the vacation time we would have to use, we decided to catch the last flight out Thursday night from Providence around 7:30pm. Perfect, we could both work a full day, and then head to the airport to catch our plane down to the warmer weather. Or…Mother Nature could throw a wrench in our plans by delivering a snow and ice storm that would delay our flight 90 minutes. Needless to say, we did not arrive to our hotel in Coca Beach until way past 1:00am. Sleep deprived…Not the best way to start a vacation! Given that we had only gotten a few hours of sleep, coffee was essential this morning. 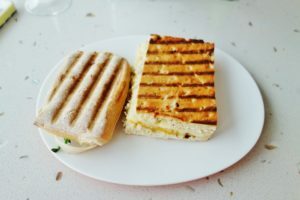 We were up around 7am, and I took a quick walk to the nearby Starbucks to grab us some lattes and breakfast sandwiches. We needed to fuel up for our first day on Enchantment of the Seas. Our hotel shuttle to the port was scheduled for 11:30am, which was a bit too late for our likings, so we decided to grab our own taxi around 9:30am. The weather this morning was foggy and cold, in the 50’s. This was already bad luck strike two! We thought we would be escaping the cold. In about 15 minutes, we arrived at the brand new terminal. It was nicely organized with easy flow of traffic and a good sized parking garage right next to the terminal! A small line had already begun forming in front of the cruise terminal entrance. So, after checking our bags with a porter, we waited in the short line until about 10 am when we were let in for processing. Once the doors opened, it was through security and up an escalator to the check in counter in less than 5 minutes. Check in was organized by Crown and Anchor status, with no one ahead of us in our line. With a quick photo and signing the Seapass contract, we were ready and waiting to board in about 10 minutes. This was much easier than the process for Quantum of the Seas in Cape Liberty. Granted, Enchantment of the Seas is a much smaller ship, so fewer travelers to be processed. 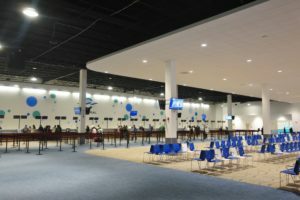 There was a special seating area arranged for Pinnacle and Diamond Plus members, as well as guests booked in Suites, but all of the other travelers were in open seating. Given that we were among the first guests, we chose seats right on the side of the boarding area. Announcements were made that the boarding process would begin shortly in order of Crown and Anchor status. By 10:45am, doors opened and we were headed to the Gangway. Down the corridor, of course there was a pit stop to take two Welcome Aboard photos. 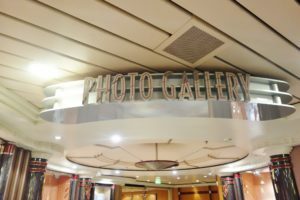 Although, given the costs of the unlimited photo package for this short cruise, we actually came home with only two professional portraits this time! Boarding on Deck 4 near the Centrum, the ship was noticeably smaller than all the ships we had sailed on in the recent past. 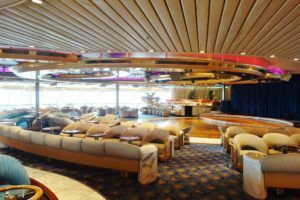 Layout wise, it resembled the main area of the Celebrity Solstice, with an open view up to deck 8. 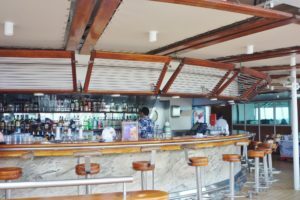 The R Bar, the main bar in this area, would turn out to be one of the hot spots on the ship, with a crowd gathering here almost immediately upon boarding. Armed with a camera and energized by being back on a cruise ship, our photo tour began! Don’t worry, our drink around the ship would start soon enough too. Let’s head to the top. Hitting Deck 9, (wait this is the pool deck? ), we took some pictures of this area, as well as the Solarium and the Spa and Fitness Center (the only time I would see this place). Grabbing all of the shots we could of this area and the outdoor spaces on Deck 10, we decided to head back inside as the weather was getting worse. 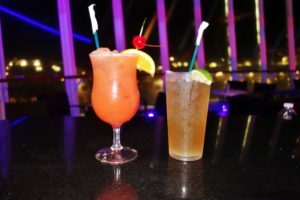 But, before that we made a pit stop at the Pool Bar to purchase the drink package. 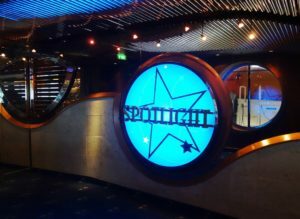 We continued our Enchantment of the Seas Review, heading up a few decks to the Viking Crown Lounge, and then made our way back down the ship, taking pictures of all the inside areas along the way, including the theater, shops, and bars. It was a new record-we were done taking photos by 12pm! Poor weather outside, rooms not available until 1pm, what were we to do? Naturally, begin our “Drink Around the Ship”. Back down on Deck 4, the R bar was getting busy as more passengers arrived. The Princess claimed some chairs while I ordered our first round of cocktails from the specialty menu. The Princess tried the “Let’s Get Fizzical”, and I sampled the “Rockstar”. My drink was not exactly what I was expecting, whereas the Princess enjoyed her sparkly concoction. It was here that our first sighting occurred-a bachelorette party! Complete with matching pink shirts, sailor caps, and adorned with nautically themed wedding phrases. Thinking nothing of it, we laughed it off, but then another bachelorette party arrived. Before long, we lost count of how many bachelorette parties were actually onboard. Getting crowded and a bit rowdy, it was time to move on. Next stop, we went back to deck 9 to the Park Café, in the Solarium, for lunch around 12:30pm. Compared to other Park Cafés, this one, found in the aft of the Solarium, is much smaller. It also felt a bit unorganized as there were no clear line designations, and the food being offered didn’t always match the menu board. 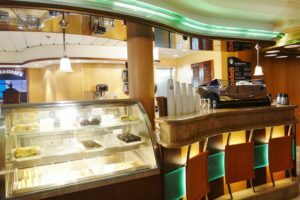 There is one counter that includes the premade sandwiches, paninis, and carving station, and another salad bar section behind that area. It was relatively quiet the few times we ate here, so we never had any issues. 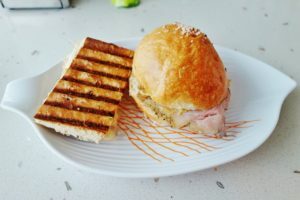 However, on our sailing, there were no roast beef sandwiches; instead, a pork loin sandwich was offered at the carving station. Honestly, this sandwich, with a bit of mustard on a moist and salty pretzel bun, was quite enjoyable as well. I’m not ready to say it is just as good as the roast beef sandwiches, but it was a delicious substitute. Wrapping up our quick lunch, we made a stop by the Windjammer to grab a few of the Coconut Ranger cookies, yes the infamous cookies-soft, chewy, and delicious. Rooms were advertised to be ready for 1:30pm, so being after 1:15pm by now, we decided to walk down towards our cabin. 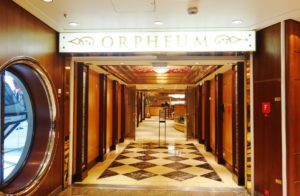 As we descended the stairs, we noticed that the doors to the stateroom hallways were open on the other floors, and by the time we were on Deck 2, yes, at the bottom of the ship, an announcement was made that the rooms were ready. 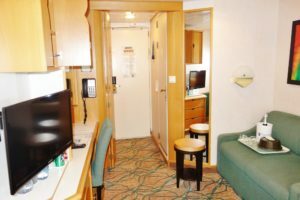 Arriving at our Oceanview cabin, we took some pictures of the room and met our stateroom attendant, Mark. He was nice and very talkative throughout the cruise. He liked to joke with me that I was always getting coffees. We hung around the room for a bit, but still no luggage was delivered. So, it was time to get our drink on…at the Café Latte-tudes. 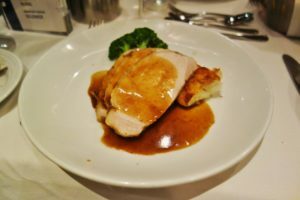 We needed to be refueled before the muster drill if we were going to make it through the first evening on the ship. 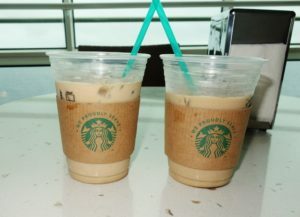 We got one iced caramel latte to share, and then I grabbed two bottles of water at the R bar. 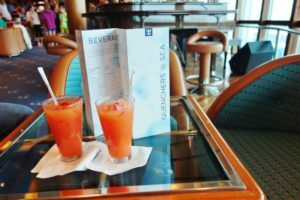 Don’t worry, after finishing these, we went to the second bar on our drink around the ship, the Schooner Bar, for a double dose of the drink of the day, the sparkling mai tai. The bar was packed, and there was some low-key piano music playing in the background. We would find out that on this cruise the people came to party, so there was always a rather long wait at the bars. 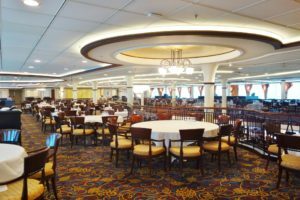 On Enchantment of the Seas, the Schooner bar was in an odd location, near the aft of the ship between the mid ship area and the Spotlight lounge. 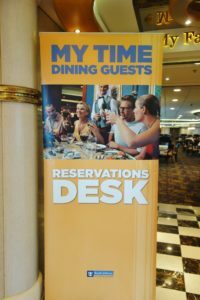 It also did not have the typical feel to which we were accustomed from previous sailings on Royal Caribbean. Finishing our drinks and hearing the first announcement that the muster drill would be occurring in 30 minutes, we preceded to our room as the Princess wanted to unpack our bags before the muster drill. There was just one problem-our luggage had still not arrived yet. So after hearing the second announcement for the muster drill, we made our way up a few decks, walking by our luggage near the staircase…at least we knew we could unpack after the emergency drill. 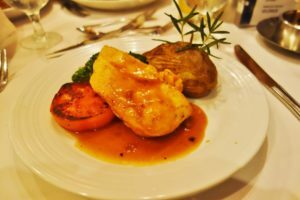 The captain was gracious enough to spare us from a long introduction due to the un-Caribbean like weather, so the muster drill ended quickly, and we were back in the room to get ready for dinner. Even though we had agreed to not get the unlimited digital photo package on this cruise, we were still planning on taking some portraits. You think I could convince the Princess to not take any professional pictures? This evening, there were four casual portrait stations. We were ready for dinner around 5:45pm, for our 6pm reservation, so took pictures at two studios. After coming off Quantum of the Seas, it was nice to return to the main dining room. 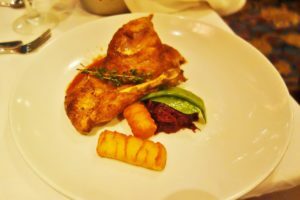 Enchantment of the Seas did have one specialty restaurant, Chops Grille, but we opted to eat all three nights in the My Fair Lady dining room. 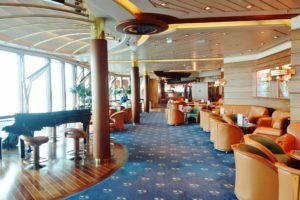 Located on decks 4 and 5, the bottom deck is reserved for traditional dining and the fifth deck is for My Time Dining guests. This was the first time we opted to try My Timing Dining. The first seating for traditional dining was 5:30pm, and even for us that felt a bit early. We made all three of our My Time Dining reservations between 6:00-6:30pm in advance of the sailing. We never had an issue getting our table, with the same wait staff, even when we showed up a few minutes late. 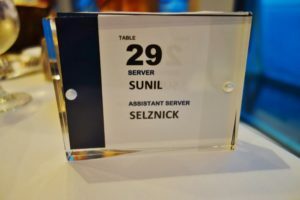 For all 3 nights, we were able to secure a table for two with the same wait staff, Sunil, our waiter, and Selznick, our assistant waiter. They were a solid team and reminded us of the dining room service we are used to on a Royal Caribbean ship. Bar service was not the greatest, but we did manage to get our nightly cocktails, a cosmo and a sidecar. 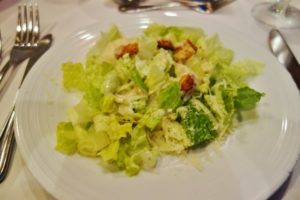 Tonight’s menu was Mojo, which meant the Princess was ordering off the Classics menu, a Caesar salad and the Marinated Grilled Chicken Breast. I warned our waiter, Sunil that I like to eat, so he was not so surprised when I ordered two appetizers and two entrees. I started with the Shrimp Cocktail, pretty hard to mess up. The cocktail sauce could have used a bit more kick, but it was pretty standard. Next, I did the Smoked Fish Rillettes. 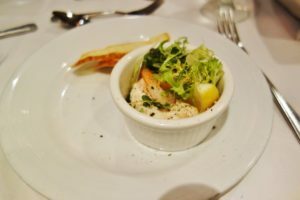 The Rillettes had a rather strong salmon flavor, but it was not too overpowering and the consistency went well with the crostini. 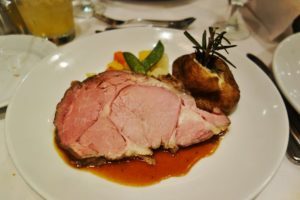 For entrees, I dove into the Slow Roasted Prime Rib first, cooked medium. 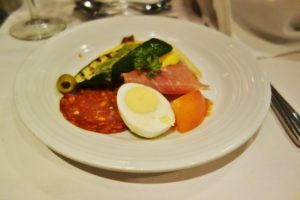 It was not really seasoned well or that warm so it was just average for a cruise ship meal. My second entrée was the Mojo Marinated Grilled Pork Chop. This entree was very flavorful. The mojo sauce was the perfect pairing with this lean and well cooked pork chop. Overall, I was glad that I ordered both meals. 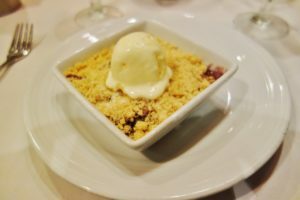 This evening, The Princess selected the better of the two desserts, the Blueberry-Peach Crumble with vanilla ice cream. I opted for the Moist Almond Chocolate Cake, also with a scoop of vanilla ice cream. 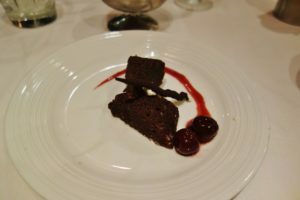 While making the reservation for this cruise, the RCI representative asked if we were celebrating anything, and I may have mentioned that February was my birthday month. So, in the middle of dessert a third sweet treat, a sliver of the Chocolate Sensation with a candle, was delivered by the wait staff. Yes, they also sang Happy Birthday to me. Dinner was done in about an hour, so we had plenty of time to get to the Welcome Aboard show. The setup of the Orpheum Theater is very unique, with oversized seats and a rather slight incline, making you feel much closer to the action. We selected the last row in the orchestra section with a couch-like seat that was very comfy. It also had a nice little table for our drinks. No more battling with those small cup holders found in most theater seats! Tonight’s show included a few musical numbers by the Royal Caribbean singers and dancers and a short set by comedian, Al Ducharme . His set included family friendly jokes which were accented by some great vocal sound effects. With the show over by 8:30pm, we had some lag time until the 70s and 80s disco party which was happening at 10pm. 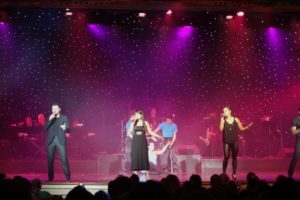 The one good thing about a 3- day cruise is that Royal Caribbean packs in many of their signature events and activities from a traditional 7-day cruise, leaving you a pretty packed entertainment schedule. To kill some time, and apparently some money, a stop at the casino was in order. Of course, the Princess found a new game on which she had some initial luck, but as the math of slot machines would have it, she ended the session down. Even I could not recover the losses at the roulette table. For this class of ship, the casino is small but manageable. The table games were never crazily busy, like Quantum of the Seas. 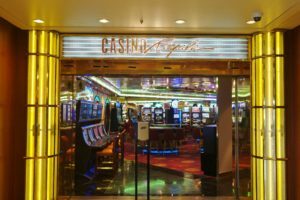 During our cruise on Enchantment of the Seas, we did not have any luck in the casino. We didn’t even win our free key chain on the complimentary slot pull! After an hour of ups and downs at the casino, it was time to head to the Centrum. 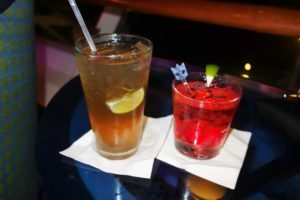 We decided to do another round of drinks at the R Bar and secure some decent seats for the party which was slated to begin in about a half hour. 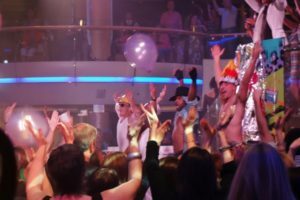 The disco party on Enchantment of the Seas is what you would expect from a Royal Caribbean ship, complete with singers and dancers performing, the ship’s own Village People doing the YMCA, and a conga line. One feature we enjoyed was the addition of some classic 80s songs to the party, instead of just all 70s hits. The party ended around 11:00pm, as did our first night on this Enchantment of the Seas Review. 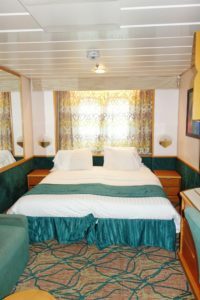 It was a busy day, and with us going full steam for the entire day, it was time to pass out in our stateroom. 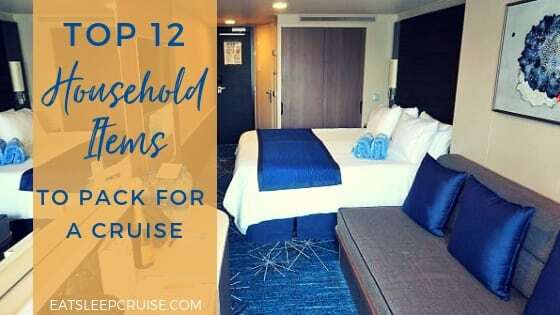 Continuing on this Enchantment of the Seas Review, we ask “Who actually gets any rest on a cruise”? Definitely not us, especially on a short cruise like this 3 day Bahamas cruise with so much to do on the ship as well as the ports of call. Our alarm was set for 7am to ensure we would not miss any of the sun and warm weather that was long overdue. Sometimes, I need a vacation after my vacation! While the Princess got ready, I went to the Café to get our iced lattes. Specialty coffee would be the fuel that would keep us going this weekend. I was not alone, as I encountered a rather long line at the shop on Deck 6. Coffees in hand, I returned to the room to get ready, and we were off around 8:30am. Park Café had my favorite breakfast burritos so we had a quick bite to eat, and then it was time for some sun! Before scouting out deck chairs, we did a loop around decks 9 and 10 to get some additional photos now that the weather was nice and bright outside. Who wants cruise ship pictures with grey skies as the backdrop? 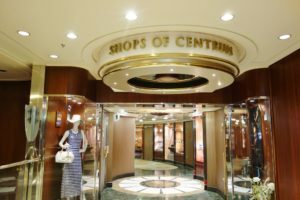 After experiencing the packed pool deck on Quantum of the Seas, we were shocked to see it virtually empty on Enchantment of the Seas. I suspect many of the cruisers partied a bit harder than we had the first night and were sleeping in that morning. 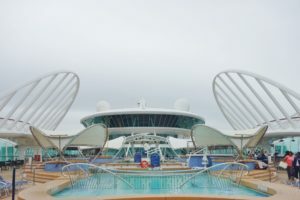 The pool deck on Enchantment of the Seas has a perfect layout. There is plenty of empty space surrounding the two pools and whirlpools allowing for plenty of sunbathers and accommodating the crowds nicely. 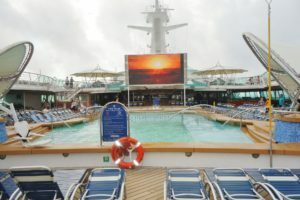 On Royal Caribbean’s newer ships, it feels like they try to cram too much on the pool deck. 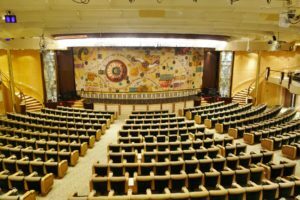 If you do not get up early, it is often difficult to get deck chairs on the main level. 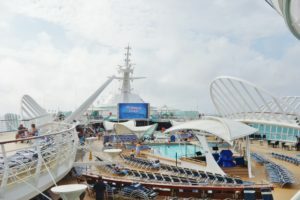 This was not the case on Enchantment of the Seas as we were easily able to find deck chairs on both days. Today, we scored two perfectly positioned chairs near the main pool. Slowly, fellow travelers began to awake and find their way to Deck 9. 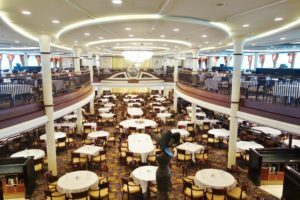 As the morning progressed, the bars were starting to get busier, but they were the only areas of the ship that ever seemed crowded. The ship was probably not sailing at full capacity which might account for why the public spaces never felt too crowded. 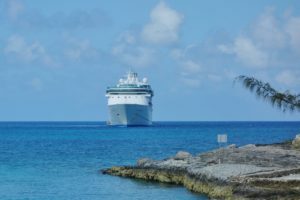 Enchantment of the Seas was set to dock at 12pm in Nassau, and we had an excursion booked which had a meeting time of 12:45pm at the pier. The plan was to head inside around 11:30am to get changed up for our Paradise Island & Sightseeing Tour. 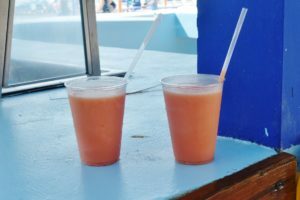 Walking by the Pool Bar, we somehow got sucked in to getting two frozen drinks. Twenty minutes later, we finally had cocktails in hand and decided to make a quick stop in the Windjammer for a snack. 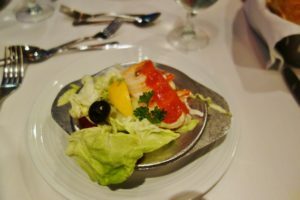 The one thing we did miss about some of the other ships we have sailed on in the past was the lack of casual eats like Café Promenade or Sorrento’s. With a quick costume change, we were off the ship by 12:30pm. 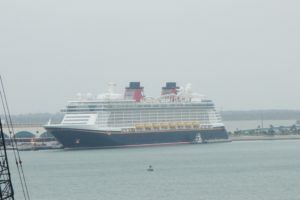 We were docked right next to the Disney Dream. Since we usually sail on larger ships, it was surprising to see that the Dream was bigger than Enchantment! Of course, exiting the gangway, there were some photographers, and it was time for some photo ops with both a male and female pirate! Sadly, they did not come out too great. Our check in point for the excursion was literally right outside the ship. After the tour guide collected our tickets, we waited a bit longer for the remainder of our party to join the tour. Given the downtime, what were we to do? Of course, take pictures! This time, it was with the new selfie stick that the Princess had bought for my birthday. Before long, our group was escorted outside of the docks and split up into 2 bus loads with a total of 16 passengers on our bus. The tour was scheduled to take about two hours, but our tour guide wanted to make sure we got our money’s worth so the tour ended up lasting almost three hours! Our full shore excursion review is coming soon, so stay tuned. Normally, getting extra time to explore the different stops would be a welcome addition; however, it was formal night. 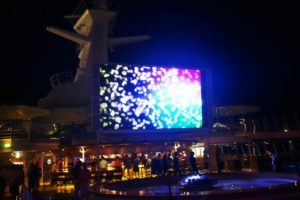 Yes, even on these short cruises, there is a formal night, and the Princess was determined to hit all 7 portrait stations. Arriving back to the ship at nearly 4 pm, we did not have much time for souvenir shopping. Luckily, one of the nearby vendors had some “authentic” Bahamas shell ornaments, so wrap that up. The Princess was able to find something from the island to add to the vacation Christmas tree! 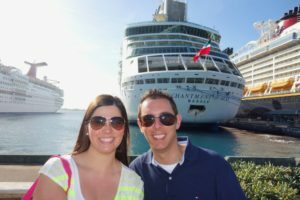 As we made our way back to the ship, we did stop for a few selfies along the way, including in front of the ship and the Bahamas sign. 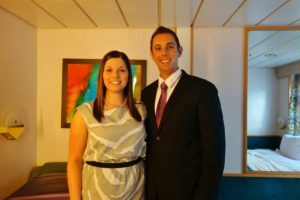 After grabbing our photo proof that we have been to Nassau, Bahamas, it was back to the cabin to prepare for formal night. 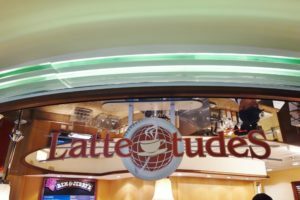 You probably guessed by now that it was time for me to grab some much needed bottled water and iced lattes now that we were back on Enchantment of the Seas. The R Bar and Schooner Bar were in full swing and even trying to get some bottled water took a while. 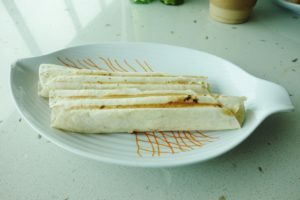 It was the same situation at Café Latte-tudes, as other cruisers also need a mid-afternoon pick-me up to get through the jam-packed evening of activities. Even though the Princess was fretting about the tour getting back late, both of us had our formal attire on and were ready to smile by 5:30pm. There were a few more travelers taking pictures tonight, but we were easily able to make our way through all seven of the stations. Our dinner reservations for My Time Dining were set for 6pm, and we arrived right on time. We had requested to keep our same table and wait staff the night before, so we were escorted to the same spot for another night of excellent service. Tonight’s menu was Saffron. Unfortunately for the Princess, this meant that there was no entrée she liked again tonight. 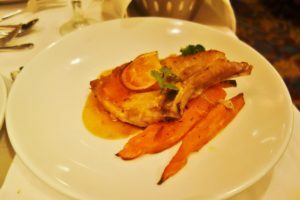 For a starter, she ordered the Oakwood Smoked Chicken Breast, which comes prepared like a salad. 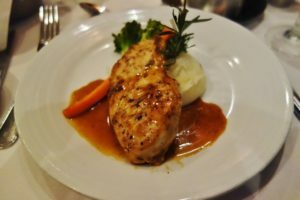 And, you guessed it, for an entree, she ordered the Classic Marinated Grilled Chicken Breast, but this time with mashed potatoes. None of the starters really appealed to me, so I ordered a double order of shrimp cocktail. I do not think the server understood what I meant by that because he only brought out one order. 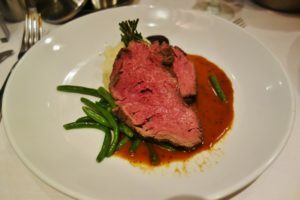 But no worries, I also ordered two entrees-the Roasted Duck and the Carved Filet of Beef Tenderloin, which was prepared medium rare. The tenderloin was melt in your mouth delicious, and the roasted duck, which was quite large, was cooked perfectly as well. Dessert this evening consisted of the Double Strawberry Cheesecake and the Sky High Lemon Meringue pie. 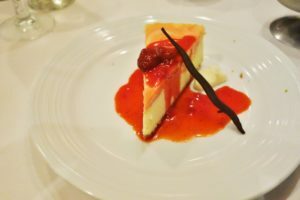 The Princess always likes to say that cheesecake on a cruise ship is not “real cheesecake”, as it is not as dense and heavy as New York style cheesecake. However, both treats were quite tasty. Tonight was the Captain’s Reception and the Presentation of the Flags. Luckily, Sunil and Selznick were quick and got us out of dinner around 7:15pm, early enough for us to get seats in the Centrum for this event. With the Princess securing our seats, I headed to the bar to get a round of cocktails. Another “Let’s Get Fizzical” for her, and I tried the “Death by Chocolate Collins”. 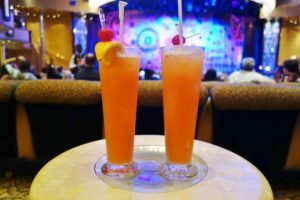 While waiting for the drinks, I started a conversation with a couple at the bar who were enjoying their first cruise. While waiting for the show to start, a waiter with champagne came by and insisted that we take two glasses. We tried to tell him that we already had drinks, but he was adamant that we take them. Well, salute to the captain and his crew! The Captain’s toast and the accompanying presentation was lively and a lot of fun. 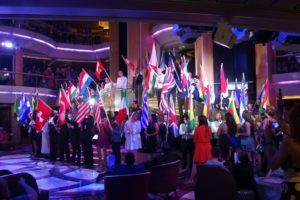 After introducing the senior officers, the parade of flags included the cruise director naming all of the countries represented by the crew. It wrapped up by 8:30pm, so we walked over to the theater for the main show, a Magician named Puck. Being fans of America’s Got Talent (AGT), the wife recognized the magician’s name. At first, it did not ring a bell for me, but after watching the opening package, I did recognize this performer. Before the show started, we were able to secure our preferred seats at the back of the orchestra main level, complete with a little table, and ordered two drinks of the day (DOTD). Good thing we had the comfy couch again because it was going to be a long night at the theater. Puck the Magician put on a good show, with plenty of humor and some solid illusions that were well executed. 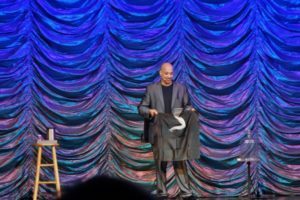 His signature trick, which won him a spot on AGT, includes a routine with a dancing napkin that moves seeming on its own. It was one of his closing acts and was a pretty amazing feat to watch in person even though we had already seen it on television. 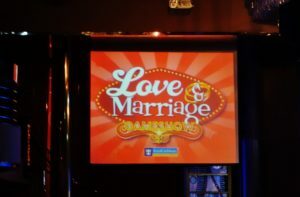 Following the magic show, the Love and Marriage Game Show was set to start in the theater. We already had prime seats, so we both took turns making a quick restroom run. Unlike the Love and Marriage shows we had seen in the past, these auditions casted a rather large net. For the first couple, they were looking for any married couple who was together five years or less. While we fit the bill, the Princess did not let me audition. The couple that was selected via a vote from the audience had been married less than a week! It kind of made us feel old as they looked like little kids. They actually sat across from us at dinner the first night, and the Princess and I were trying to figure out their story- ie. Were they a couple or brother and sister? Guess we got our answer tonight! The second couple picked was married about 20 years, and the “senior couple” was married over 50 years. This older couple was traveling with their kids and grandkids, and they were a riot! The newlywed couple ended up winning the show, but since the auditions for the three couples lasted quite a while, it was passed 11pm by now, and the sail away pool party on deck 9 was already in full swing. Along with plenty of other members of the Love and Marriage Game Show audience, we headed up to Deck 9. 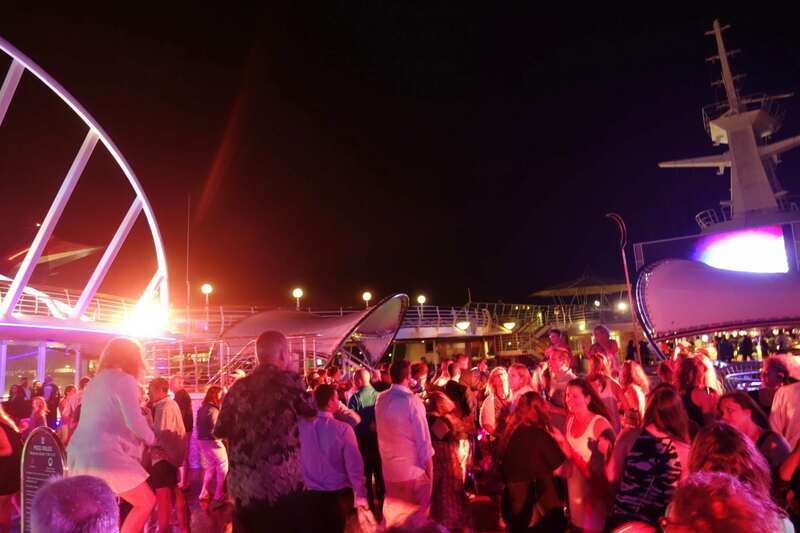 Greeted by a deck full of cruisers, dancing and singing under the Caribbean sky, it was obviously going to be quite a night. 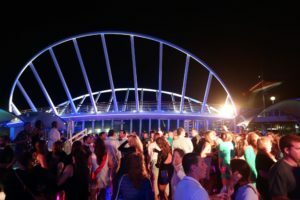 The sail away was a blast complete with the DJ spinning popular music and neon lights. 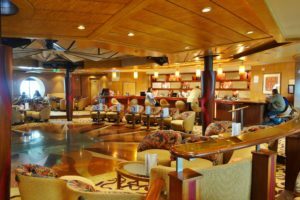 We managed to find some chairs on the starboard side, and I squeezed through the masses to grab us two drinks from the Oasis Bar. Lucky for us, this party included a midnight buffet that had a variety of snacks, such as nachos, small desserts, fritters, and chicken wings. So, after grabbing our cocktails, I headed over to the line to grab us a few snacks. Dancing to a good mix of the 80s, 90s, and today, it wasn’t long until the ship was pulling out of port. The time had escaped us; it was already after 12:30pm. By this time, the crowd was starting to disperse. For us, this was the cue to call it an end to the second day of our Enchantment of the Seas Review. Really, it’s already the last day of the cruise? Unfortunately, yes. But, there was still plenty to do and see on this final day, especially since we were heading to Coco Cay, one of Royal Caribbean’s private islands. We had not been here since our Freedom of the Seas cruise in 2010. 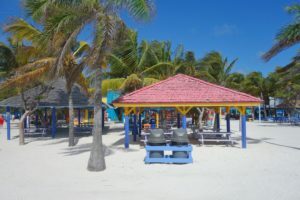 Given that last time we visited, I lost my wedding band, Coco Cay had not been on our must visit list. This time around, we had a mission, a complete photo tour of the island with our new camera. There would be no swimming or snorkeling for me! Upon returning to our room late last night, we ordered room service for breakfast. 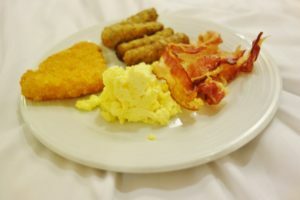 This was something else we missed on Quantum of the Seas as room service hot breakfast is not complimentary on that ship. Good thing that was not the case on Enchantment of the Seas. The boat was set to dock at 9am, and we had no official excursions booked, so we could have taken our time getting off the ship, but what fun would that have been? We opted for breakfast to arrive between 7:30 and 8:00am, knowing that yet again, the alarm would be going off at 7am. Yes, we could always take a nap in the sun. The Princess hopped in the shower, and promptly at 7:30am, the phone rang to let us know breakfast was on the way. About 10 minutes later, it arrived, complete with plenty of eggs, bacon, sausage, and hash browns. After getting ready for our beach day, I headed up to grab us some lattes. Then, we were off, grabbing towels along the way. Progressing toward the gangway to await a tender boat, we heard the cruise director staff yelling “last call”. We, along with the other fellow cruisers in the stairwells, picked up the pace to catch the boat. Then, we began the 1 mile voyage to the island, reportedly docked a bit further out to shore than usual due to wind conditions. 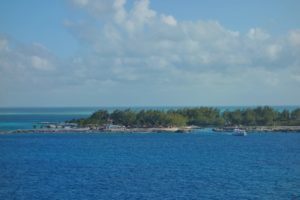 Arriving at Coco Cay, the island seemed a bit more welcoming than we recalled from our previous visit. Of course, those memories could have been tarnished by my clumsy swimming and rocky beach bottom. Getting off the tender, of course there were some photo-ops, but given that we did not purchase the unlimited digital photo package, these photos did not make our cut either. So, our photo journey began. 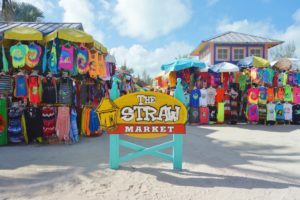 Starting near the entrance, then the Straw Market, next to the Cocothepia Bridge, and all the way around the island for about 90 minutes we walked, capturing shots of all the beaches, the bars, the dining areas, even parts of the nature trail. At the end of Barefoot Beach, we took a right and stumbled onto an access road that runs basically the length of the entire island, so of course we took pictures of that too. 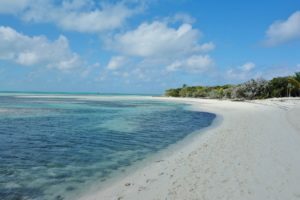 We had completed our photo tour of the island by about 11 am, so it was time for some sun. We planted ourselves in two chairs right before Barefoot Beach. Now it was time for some Coco Locos! 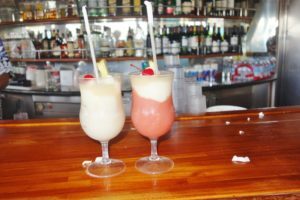 Yes, this private island also has its own signature drink, similar to the Labadoozie in Labadee. You can get a non-souvenir cup of this beverage as part of the drink package. Or, if you want the souvenir cup, it is a one-time charge of $3.50, and then you can get refills as part of your drink package. We opted to not purchase the souvenir cup. It was hot the day before in Nassau, but today felt even hotter. I was fine soaking up the sun, but after about 2 hours the Princess had had enough. 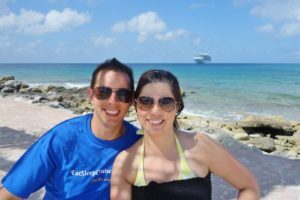 Ok, this was a perfect excuse for advertising- walking around in my EatSleepCruise.com t-shirt while gathering bottles of water, some more Coco Locos, and taking some selfies in front of the ship. Hey, this is the perfect market for acquiring more readers! By now, the smell of the beach barbecue was billowing. Funny thing, I was not even hungry. It is customary for me to get some delicious ribs for lunch, but I just couldn’t fit them in. 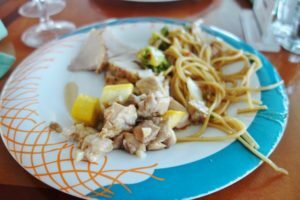 Even still, I made sure to grab some photos of the lunch buffet for our review of Coco Cay, while the Princess may have grabbed a cookie or two. A stroll through the straw market and two t-shirts later, a tender arrived and even though it was early, we decided to head back to the ship. I could always go swimming in the pools onboard. 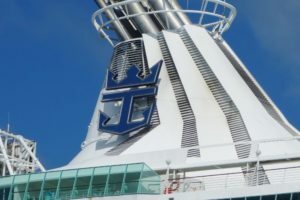 Sitting on the top deck of the tender boat, I grabbed some great photos of Enchantment of the Seas, floating in front of us. You can never have enough cruise ship pictures! Arriving back on the ship around 2pm, we dropped off the towels, grabbed some bottled water, and went back to the room for a little break. Looking over the Compass, the Princess noted that the casino was open. Not that we had any luck up to this point, but it was an indoor venue where she could escape the sun for a bit. Well, 90 minutes later, the Princess lost more money in the slots, and I was slightly down on blackjack as well. Now, we were both starting to get hungry but were in food limbo. 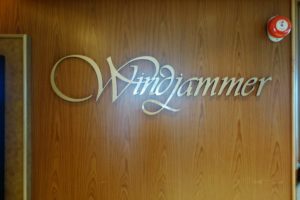 The only option was tea and snacks in the Windjammer. I have to laugh that it is called tea and snacks. Only Americans would consider nachos, hamburgers, hot dogs, and pizza “snacks”. 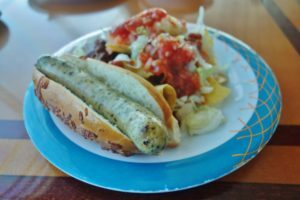 I’m not complaining, as I made a generous serving of nachos and chili along with one sausage that reminded me of the SeaPlex Dog House on Quantum on Seas. Sadly, while it looked the same, it didn’t taste the same. 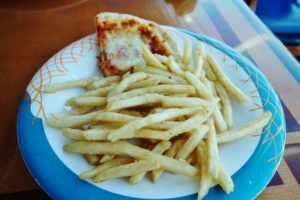 The Princess made a signature plate of French fries and pizza, with some nachos and cheese on the side. 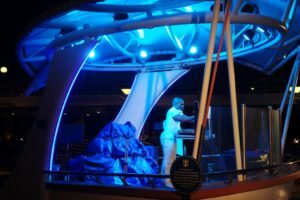 We still needed to finish our drink around the ship. Outside, the last bar on this tour was the Solarium Bar. But first, the Princess made a stop for a cup of soft serve ice cream. Given that we didn’t have any on Quantum of the Seas, I may have grabbed a cup for myself as well. 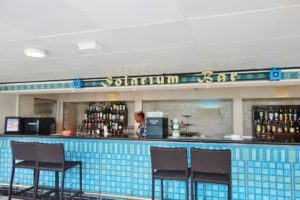 At the Solarium, which was relatively empty, we ordered two drinks of the day. 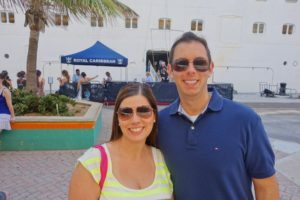 After sipping the drinks for a few minutes and comparing Coco Cay to Labadee, it was time for us to get ready for dinner. 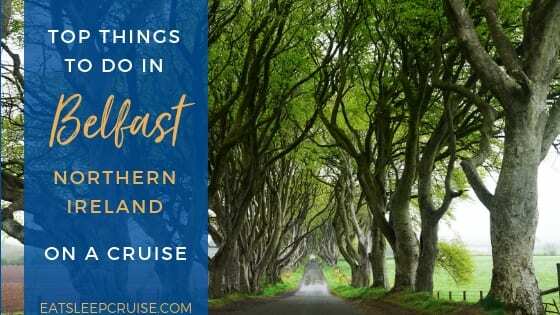 During this three day cruise, there was a lot happening, and deciding what to do meant we sometimes had to make tradeoffs. Our reservation for dinner tonight was 6:15pm, and the farewell show in the main theater was starting at 7:30pm. We knew that it was going to be tight timing wise, but none of the shows had been overly busy, and dinner service had been quick the past 2 nights. Arriving to dinner a few minutes late, it appeared that there were two people sitting at our table! The Princess swore they gave our table away. For some reason, it took much longer to check in tonight than normal. Great, wasting more time! After accommodating the group in front of us, the hostess indicated that we could just seat ourselves. As we approached our table, it was indeed empty, but the other travelers who usually dined around the same time as us seemed to be shifted to other tables within the section. This is what confused the Princess at first. Nonetheless, we all had the same wait staff for the evening. Tonight was the Pimento menu. Finally, something the Princess liked! 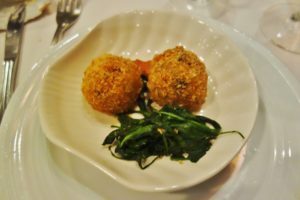 For starters, we both ordered the Arancini-a fried risotto ball served with a dab of marinara sauce. Not that we were really going to need to eat all of this food, but we both ordered a second appetizer. 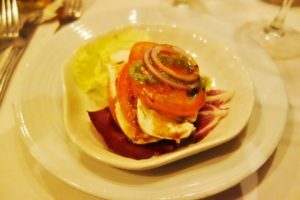 The wife ordered the Caprese Salad, and it was the Antipasti for me. All of the appetizers were delicious. Still waiting for our entrees, we noticed the time ticking away. It was already 7:15pm, so the Farewell Show was probably going to be out of the question now. 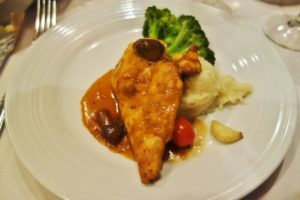 Tonight, the Princess ordered the Chicken Marsala. She liked the sauce, but the cut of chicken was not very tender. I did the Garlic Tiger Shrimp and the slow roasted Pork Tenderloin, on recommendation from our server. The Shrimp is always a great choice; with a light coating of butter, they were perfect. Even though I didn’t need to, I knocked out most of the pork tenderloin too, which was very tender and good as well. We debated skipping dessert and going to the show, but decided against it–like we needed the dessert. 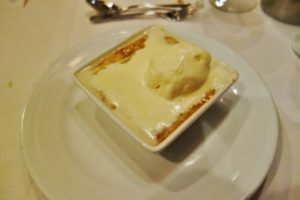 So, I ordered the Tiramisu, and for a change, the wife tried the Sticky Bread and Butter Pudding. 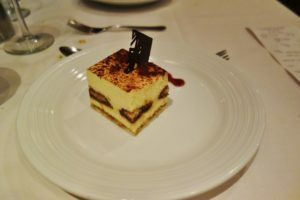 The Tiramisu was better than the Sticky Bread. Of course, I usually pick the better dessert! After dessert, we said good-bye to our wait staff, giving additional gratuities to both the waiter and assistant waiter for their solid service. Not that we were looking (okay, we were looking), but we did notice none of the couples near us, who had also eaten all three nights in this same area, gave our servers additional tips. 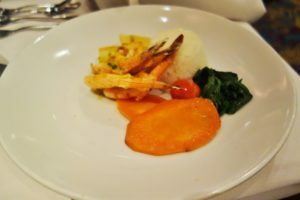 Never having done My Time Dining, we didn’t know what to expect, but it was definitely our observation that less envelopes with additional gratuities were given here than in the traditional dining set-up. With dinner complete, it was time for the daunting task of picking out pictures. As a Crown and Anchor discount, we each got a buy one get one 50% off coupon, which meant we would probably buy no more than four photos. With a pretty weak showing of only about 60 photos, we still spent close to 45 minutes before deciding on two 8X10s to purchase. The Princess was not happy with the selections. Note to self, if your wife asks which picture you like best, always pick the one you think she looks better in! Finally with only 2 photos in hand for purchase, we decided to discard the rest of them. We then stopped at the onboard shops to pick up an ornament for our vacation tree. With the ornament and photos in tow, it made sense to return to the room to store these away. 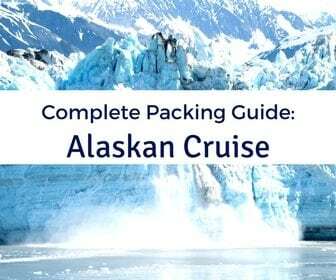 Even though it was just a couple of days ago that we boarded the ship, tonight meant there was some packing to be done. Luckily, we did not fully unpack much of our stuff, so it did not take us too long. 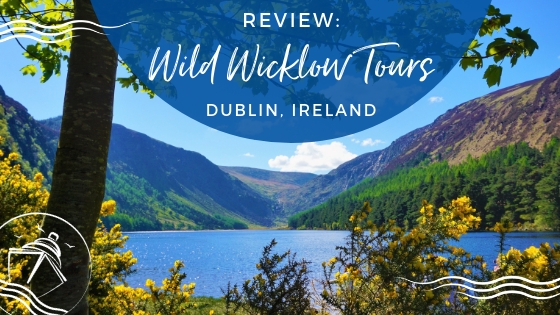 Weighing our large suitcase, it was right at 50 pounds, and the small suitcase was maxed out, literally bulging, with a total of 30 pounds of clothes and toiletries. 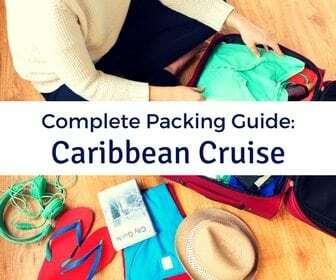 How does the Princess manage to pack so much for only a 3 day cruise? Our plan for the evening now was to head to Boleros for a cocktail to continue our drink around the ship, then make our way to the Comedy show for 10:30pm, which would give us a short window to catch some of the Quest before sneaking out to the Casino for the slot raffle, and finally ending the night, and our drink around the ship, in the Viking Crown lounge. 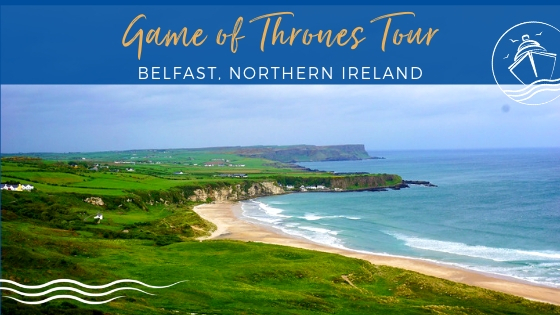 A packed itinerary indeed! On our way to Boleros, we walked through the Centrum where rock-a-rokie was taking place. This is essentially karaoke with live musicians. Our timing was amazing as we happened to catch a young man singing “I Will Always Love You”, by Whitney Houston, and he NAILED IT! It was an unbelievable performance packing the entire three decks of the Centrum. I felt bad for the woman who had to follow this performance. It was now about 9:30pm and Boleros was relatively quiet. 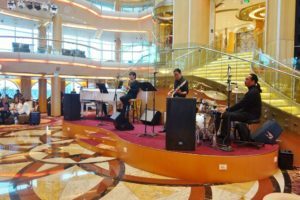 There was a three piece band singing some traditional lounge music, some Neil Diamond and 60s Motown. Here, the Princess got another drink of the day, and I ordered a mojito. This Boleros was in an usual location, and to the Princess’ dismay, did not have a specialty drink menu, so unlike many of the Boleros on other ships, it was never really busy. Finishing our drinks, we made our way to the theater for the late night comedy show. Unfortunately, “our” seats were taken, even though the theater was relatively empty. We got seats nearby, ordered two drinks, and relaxed until show time. The cup holders on this ship were much better than the newer theaters; they actually fit your beverage glass. It’s the little things that make a difference. The late night comedy show featured a set by Al Ducharme, the same comedian from the first night. His material was not really too “adult”. His jokes seemed to be more hit or miss with this crowd, mainly because he did do some atypical cruise material. 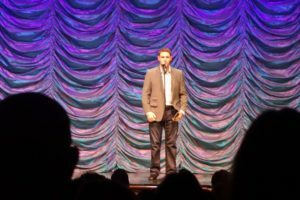 His set included lots of jokes based on sound effects and facial expressions, and some of his largest laughs came when he made fun of a woman leaving the theater. You guessed it, farting noises were involved. At the end of his show, we made a dash to the Quest in the Spotlight Lounge. This is the adult game show, which is really just a scavenger hunt. The venue was packed, and the odd design made it difficult to find seats. We ended up on the ledge near the main walkway into the theater. It had been a while since we watched the Quest, so it was fun to be spectators for a bit, not active contestants. The $500 slot raffle was happening at 11:30pm, and with a few tickets in hand, we snuck out of the Quest to see if we could recoup our losses. No such luck! Oh well, this would be the third cruise in a row we were defeated by the casino. 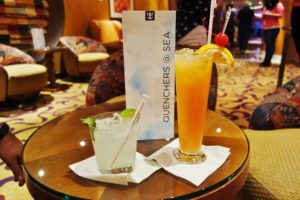 Our final stop of the evening to complete our Enchantment of the Seas Review, and the last bar on our drink around the ship, the Viking Crown Lounge. When we arrived, the dance floor was packed, but there were plenty of empty seats. I made my way to the bar to order us some drinks, and we spent the rest of the evening grooving to the music and people watching. There were definitely some sights to be had tonight! Wow! 6am came quite early. The sail into Port Canaveral seemed a little rocky. I think there may have been some issues docking the ship. 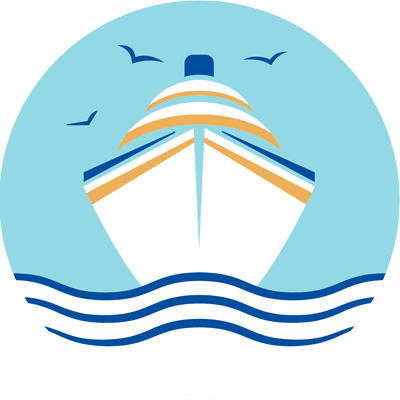 It was also announced that disembarkation would be slightly delayed due to an issue with the hydraulic system on the gangway. 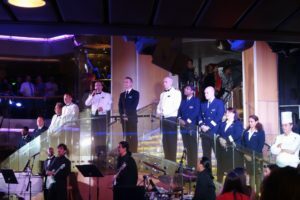 Shortly after, we heard the announcement that self-disembarkation was beginning, but that departing guests had to meet at the theater on deck 5 to exit, instead of the gangway on deck 4. Even though we were carrying our own luggage off the ship, we weren’t ready to leave just yet. We needed some coffee and breakfast before saying good-bye to Enchantment of the Seas. 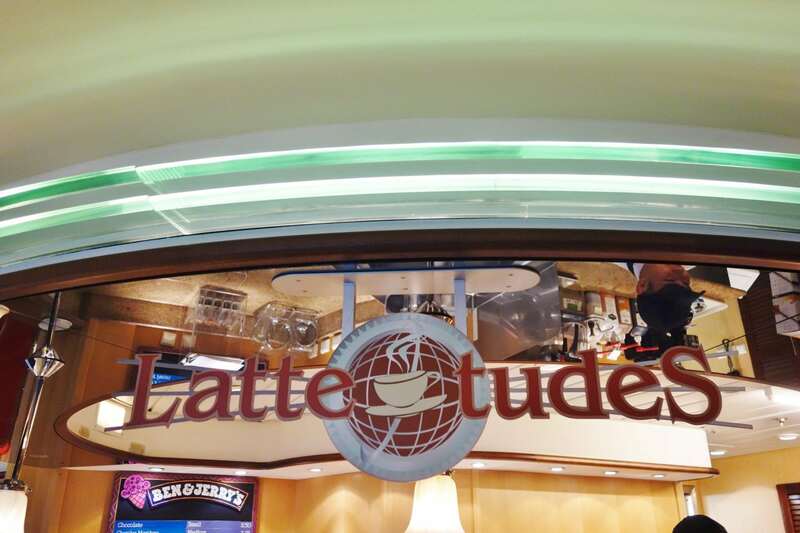 So, we left our bags in the room and went to Café Latte-tudes. 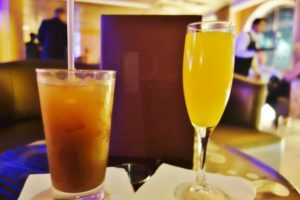 Tip: The beverage package covers your drinks on disembarkation morning too. We grabbed some iced lattes and a few small breakfast pastries. 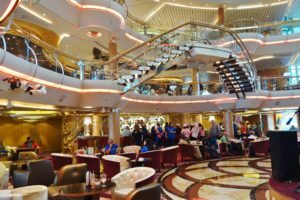 Sitting near the Café, we could see the mass of people on deck five exiting the ship. During this time, the gangway on deck four also opened. As we headed back to the room, the last call was made for guests carrying their own luggage off the ship. Okay, we get the point! We grabbed our bags and made our way to the elevator. Mark, our stateroom attendant, was nowhere to be found, so we did not get to say good-bye. It took a few minutes to get an elevator in which we could fit with our luggage in tow, but then it was up two floors and off the ship in a matter of minutes. 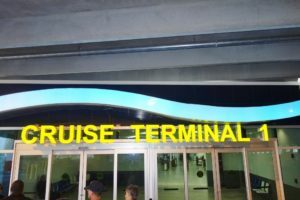 The new terminal in Port Canaveral is well designed with a ramp leading down into customs, making it much easier to exit with luggage. No escalators to try to navigate. Once off the ship, we waited in the massive line for customs for at least 25 minutes. The Border Patrol definitely understaffed this area. Hopefully when Oasis arrives in 2016, they will have many more agents open to process travelers. All in all, disembarkation was smooth, even if we did have to wait a while in that long, zig-zagging custom’s line. Exiting the terminal building, it was another foggy overcast day. 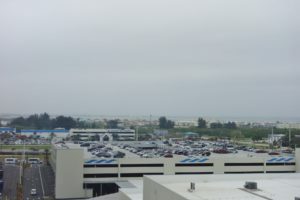 It didn’t look like those boarding Enchantment of the Seas today were going to have good weather either. 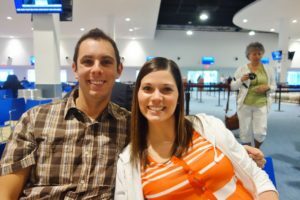 With a 1pm flight out of Orlando International Airport, about 45 minutes away, we had pre-booked transportation to the airport as part of our hotel package deal. We met our transportation at the designated area and were put on a small van with one other couple from our ship. The van then stopped at the Disney Magic to pick up two other families. Once everyone was onboard, the van was relatively quiet during the trip to the airport. Upon arriving at the airport, we checked our bags, revealing that the large suitcase actually weighed 51lbs, really? We had pre-checked with our travel luggage scale this morning! Luckily, Southwest did not charge us for the extra pound. So, now it was through security and to the gate, with 2 hours left until departure. We had a rather eventful flight home with a medical emergency and multiple sick children, but we arrived home nonetheless. We were back in New England. Our short three day cruise was already over, and we had nothing else to do but to start examining itineraries and planning our next cruise. 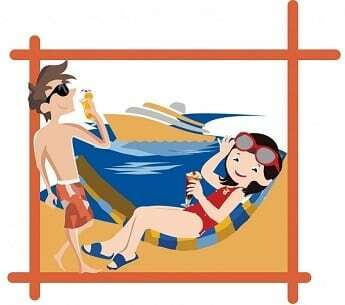 Stay tuned for our “adventures” on Adventure of the Seas in August!